As the nation struggles with a shortage of workers and an aging population, this is the first in a four-part New Year’s series examining Japan’s immigration policy. Tokyo-based Ips Inc. is a telecom firm specializing in business targeting Japan’s 250,000 Filipinos, the third-largest foreign community in the nation. Masako Uemori, one of its top executives, has keenly felt major changes in the business environment over the past 10 years. In 2006 the company launched a dispatch service that sends Filipino caregivers to day care centers for the elderly. At that time, few facilities were willing to use the firm’s new service, Uemori recalled. “They didn’t even open the door for us. They asked, ‘Why do we have to hire foreigners?’ ” Uemori recalled. “But the situation has been totally reversed. 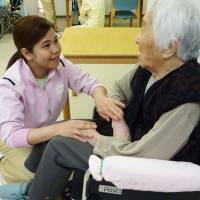 Now, day care centers ask us to find workers at any rate because they are running out of caregivers,” she said in a recent interview with The Japan Times. Today, many day care centers are willing to hire Filipino residents of Japan. About half of the 250,000-strong Filipino population in Japan has permanent resident status because many have married Japanese. Hence there are no visa restrictions to working here, Uemori pointed out. Uemori’s story illustrates the reality of Japan’s rapidly aging society and probably points to its future. Economists expect Japan to develop a severe labor shortage soon, and many argue that it will have to allow in more overseas workers if it wants to maintain its economic strength. “The labor shortage will be one of the most serious problems for the Japanese economy over the long term,” said Yukio Noguchi, an economist and adviser to Waseda University’s Institute for Business and Finance. According to the latest predictions put forward by the National Institute of Population and Social Security Research, Japan’s population will more than halve from 126.8 million this year to 50.56 million in 2115, given the low birthrate. The Cabinet Office has, meanwhile, projected that Japan’s working population of those aged between 15 and 64 will have shrunk to 37.95 million by 2060 from 65.77 million in 2013.Based on a 2011 simulation by the Health, Labor and Welfare Ministry, Noguchi estimated future demand for nursing and medical workers and came to a shocking conclusion: Demand will be so strong that workers in the industry might constitute as much as 25 percent of the labor force when it peaks in the 2050s. “One in every four workers in Japan could become a nursing or medical worker. The nursing service is of course important, but other sectors will suffer from intense labor shortages,” Noguchi warned. “The only solution is to introduce immigrants because it is very difficult to raise the productivity of nursing services by introducing robots or other machines,” he added. Whether Noguchi’s prediction will prove to be true remains to be seen. But signs of a long-term labor shortage in Japan’s graying society already appear to be emerging. In November, the ratio of job offers to job seekers rose to 1.56 — the highest since January 1974 — partly because of population shrinkage. The ratio in the nursing industry — notorious for low wages and tough working conditions — was particularly high at 4.04, meaning there were more than four job openings for every person seeking work in the sector. The Cabinet of Prime Minister Shinzo Abe has officially declared that it will never adopt “an immigration policy” to address population-related issues. Instead, Abe has pledged to take measures to encourage “professional” foreign workers, such as those in the financial and IT industries, to settle in Japan by easing visa conditions for them. In Japanese politics, the word immigration remains a taboo subject because many people associate it with crime, terrorism and ethnic tensions, as well as a widening wealth gap as seen in many developed countries in recent years. But Noguchi maintains that Japan should immediately open its doors to immigrants, particularly caregivers, because it’s economy is losing strength and becoming less and less attractive. “It’s too optimistic if you believe immigrants are willing to come to Japan on request. It’d be too late if, in 20 years, Japan starts asking them to come,” he said. Top officials in the Abe administration appear to be well aware of the problem because major business lobbies have repeatedly called for more foreign laborers. As a compromise, the government has been bringing in hundreds of thousands of unskilled workers by giving them “student” and “trainee” visas, experts point out. Officially, the main purpose of the trainee system is to invite people from developing countries to acquire skills and knowledge in Japan for transfer to their home countries. The trainees are obliged to return to their countries within five years at the latest. The system, however, has been criticized for years as a back-door immigration policy that serves as a source of cheap migrant labor. After they arrive, the “trainees” aren’t allowed to choose a job or employer. This often allows employers to get away with offering low wages and below-standard working conditions, experts say. Foreign trainees in Japan are mainly sourced from other Asian countries, including China, Indonesia, Vietnam and the Philippines. Their numbers jumped to 251,721 in June, up 77 percent from 141,994 in 2011, according to the Justice Ministry. More than 5,000 of them deserted their jobs and disappeared in 2016. Many are believed to have left because of low wages and bad conditions. Saburo Takizawa, an expert on immigration and refugee issues who is a professor at the graduate school at Toyo Eiwa University in Tokyo, said the government officially defines immigrants as those who enter Japan with permanent resident status. By that definition, there are few “immigrants” in Japan. But the United Nations defines immigrants as anyone who lives in a foreign country for a year or longer, he pointed out. “(Officially) there are no immigrants in Japan, so you don’t need to take any policy measures for such people. It’s convenient because the government can renounce its responsibilities” to foreign residents, he said. Takizawa argued that this is one of the reasons Japan still lacks key integration measures for foreign ethnic groups, such as those to support education for newcomers. Japan has more than 1.08 million foreign workers with proper visa status. That represents a 57.9 percent spike over the past five years, according to the Health, Labor and Welfare Ministry. Much of the increase can be attributed to surges in trainees and working students. Those holding the two types of visas accounted for 19.5 percent and 19.3 percent, respectively, of the total in October 2016, according to the ministry. Abe’s government, however, has yet to admit it is unofficially introducing unskilled labor on a grand scale under the so-called trainee system. Instead, it appears ready to tap the system even more to help ease the labor shortage. In November, the government added caregivers to the list of nonprofessional laborers who can be brought in from overseas under the trainee system. However, without improving living and working conditions for foreign residents, Japan may not be able to attract the numbers it needs in the future. Lilian Shiina, a 51-year-old Filipino who works at a day care center for the elderly in Kawasaki, said caregiving in Japan is never as easy as many Filipinos think. Shiina has lived in Japan for 25 years and has permanent residency status. Still, she sometimes gets frustrated with the language barrier and the working culture. For example, she tries to treat the elderly like family members as many Filipino caregivers do, but Japanese tend to maintain a certain distance, she said. 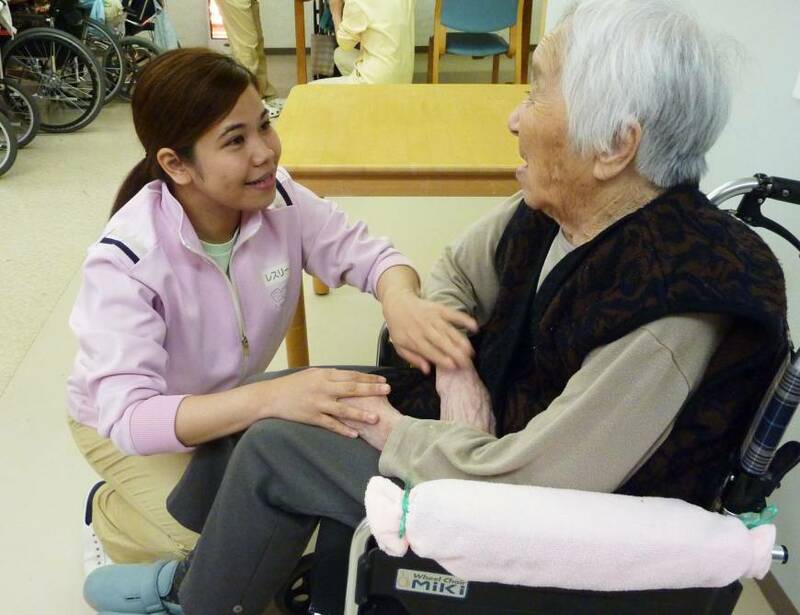 Filipino caregivers are required to be fluent in Japanese if they want to work at a day care center in Japan, she said. “If Japan needs caregivers, it should adopt different cultures, be it (that of) the Philippines, Malaysia, or Indonesia,” she said. “I have been here in Japan for a long time . . . if you are coming from the Philippines to Japan as a caregiver, you have to be tougher than me,” she said. “If I, based in Japan, am having a hard time, what more (difficulty) will you have? You have to study Japanese very well,” she said. Staff writer May Masangkay contributed to this report.